All children and young people with learning disabilities have a right to positive mental health, but they are at least four times more likely to experience mental health problems than their non-disabled peers (Carpenter et al., 2010; Dossetor, 2009; Emerson and Hatton, 2007). As with typically developing children, children with physical and/or learning disabilities who are not resilient struggle to cope emotionally, socially and educationally. Research has shown that therapeutic writing interventions, including journal-writing, can lead to reductions in stress, behaviour difficulties, depression and anxiety, as well as improved coping strategies and educational outcomes (Maclean, 2013; Murray, 2008; Waters, 2010). Find different ways to think about themselves. The teachers’ role was to facilitate a child-led journey towards developing ‘mental wealth’. 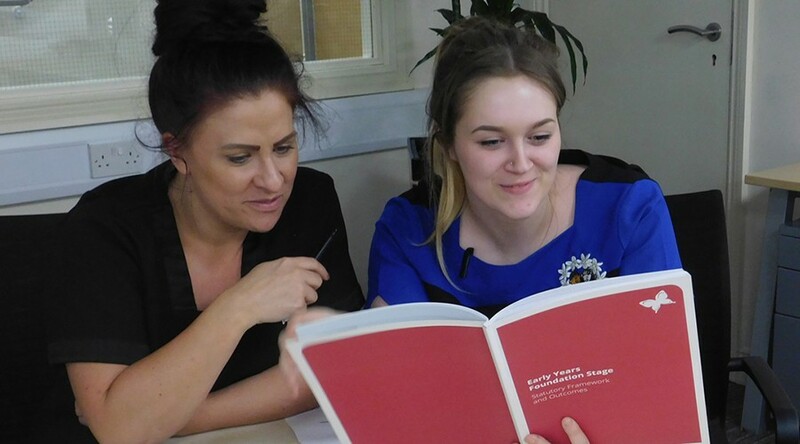 They received training in supporting pupils through the journals from the journals’ author, Marilyn Tucknott. Eleven pupils with complex needs across the range of key stages took part in the project between June 2015 and May 2016. The teachers adopted an action research methodology using an assess–plan–do–review approach (Department for Education/Department of Health, 2014), and were guided by a project advisory group. Throughout the project, teachers collected a range of evidence. They periodically videoed journal sessions (if appropriate) so that levels of pupil engagement during journal activities could be assessed. Other records (e.g. from teachers’ research diaries, focus groups, interviews and pupil feedback) supported this. The project’s consent, assent and other ethical research issues were aligned with the current British Educational Research Association ethical research guidelines (BERA, 2011). It’s the only time really when you shift the priority to the pupils not the …lesson objective… It’s the only time in the week when you say ‘This is yours…. There’s no right or wrong. I won’t give you ticks. It’s yours, and if you don’t want to share, you can [make that decision]. One pupil, recognising this, commented that it felt good that the journal sessions were all about the pupils, and not about the teachers. Adapting the journals for the Chadsgrove pupils involved the scaffolding and personalisation of themes and ideas so that they could connect with the journals’ key mental wealth messages. Teachers kept records of the adaptations, issue-solving decisions and outcomes. For the KS1 pupils, personalisation related to the experiential. Although they had been excited to have their name on the cover of their journal, they were not able to access the activity without the teacher due to lack of understanding or fine motor difficulties. The teacher and the teaching assistant therefore developed and mediated personalised activities related to their chosen pages within a circle time setting. 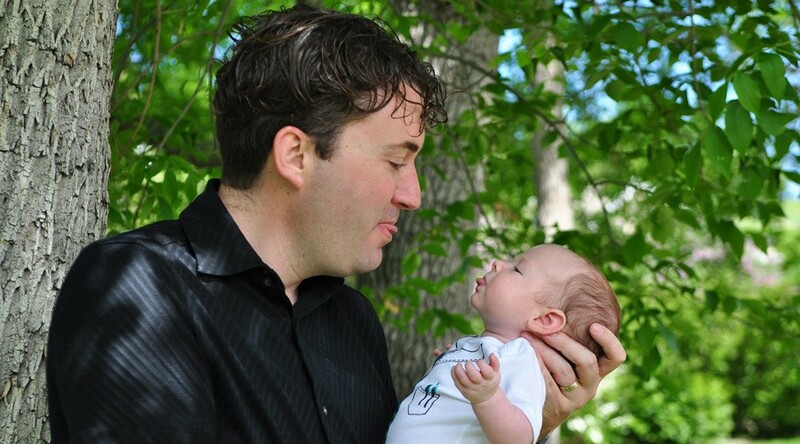 The sessions focused on ‘Smile’ – making a smile; smiling at others; activities that make me smile. One pupil was delighted by the noise and feel of hard materials. Together with the Structured Teaching Practitioner, the staff created and introduced a ‘smile box’ for her containing the materials that made her happy (see Figures 1 a & b). The eventual aim (not achieved during the project) was for the pupil to be able to request the box to lift her own mood when needed. Figure 1a. 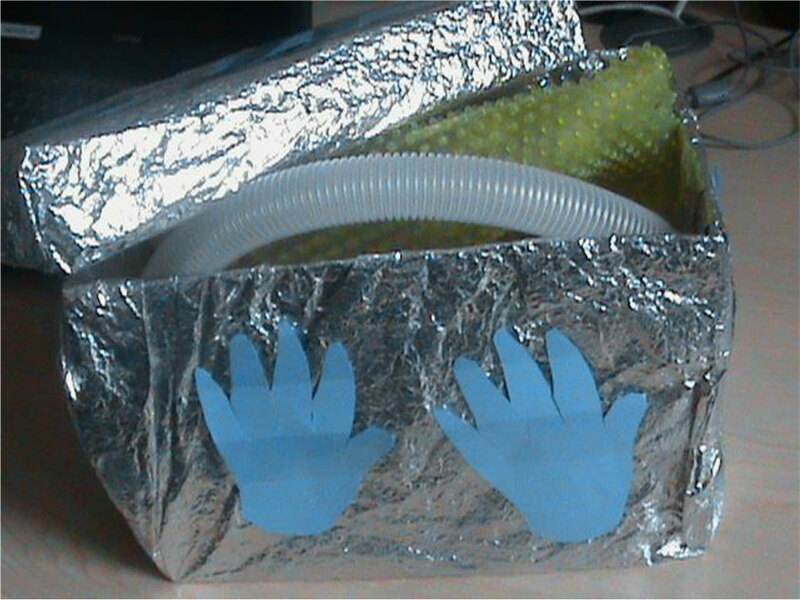 ‘Smile box’ containing sensory materials and decorated with the pupil’s hand silhouettes. Figure 1b. The pupil’s delight at being offered her ‘smile box’. The KS2 group were quite linguistically able, but needed support to understand text, and struggled with writing. At the start of the project, they were able to discuss issues, but their emotional understanding was below age-expected levels, and they did not have the language to identify complex emotions. The journal sessions were therefore carefully structured to support the pupils in making/understanding connections. They were practical activity based. The teacher created symbolled word banks with vocabulary that linked to the different sessions, and supported pupil recall and conversations. Table 1 (below) shows how selected Journal pages, page topics, themes and connections from the KS2 journal, Understanding Me, were developed by the KS2 teacher. KS3 and KS4 pupils were able to discuss the topics in the KS3 journal, Live Out Loud. The teachers and their class teams found that the activities were appropriate but that the concepts and language needed to be adapted to the pupils’ levels of understanding. They needed to scaffold pupil discussions, demonstrating how to use skills of visualisation and reflection, and to provide them with concrete examples and reminders of key words and concept definitions (using printed or symbolled text). The staff also checked frequently that pupils had properly understood and remembered concepts. They related issues they were discussing to visual or descriptive resources (e.g. emotions colour wheel) and ‘real life’ experiences (e.g. things that they did in the half-term holiday and how these made them feel). The visual resources created by the pupils were secondary to the discussions, but very necessary for their full understanding. A key aim for KS3-4 classes was to extend the emotional language they used beyond ‘happy’ and ‘sad’ using a Graffiti Wall (see Figure 2) so that they could begin to understand and describe the different intensities of emotion that they experienced. 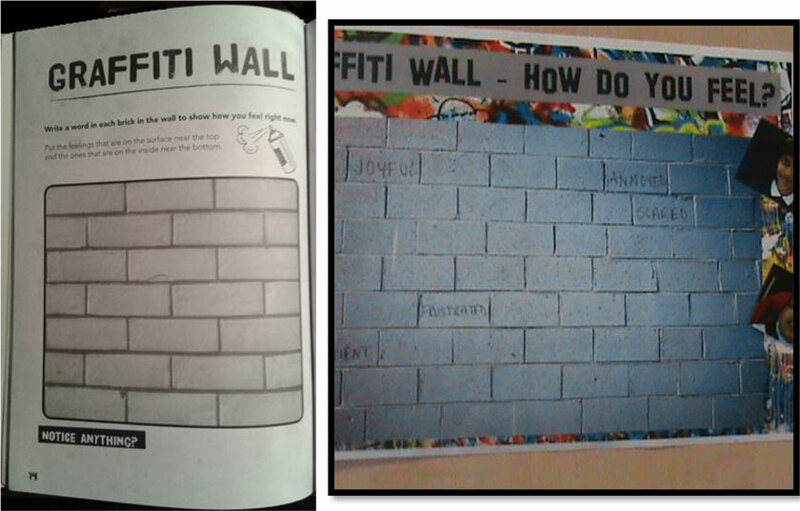 This page in the book was too small, with pupils’ fine motor difficulties, for them to write words in, so the graffiti wall was redrawn as a wall poster that pupils could contribute words to. [The Graffiti Wall] stops them from saying ‘It makes [me] feel sad’; ‘It makes [me] feel happy’. I said, ‘We’re not saying “happy” or “sad”; we’re trying to think of other words,’ and that’s when [G] said, ‘It makes me feel joyful.’ [F] said his worst chore is drying the dishes, and I said ‘Why don’t you like it?’. And he said, ‘Because you’ve got to wait for the person who’s washing the dishes up and I don’t like it. I don’t like waiting.’ I said, ‘So how does that make you feel.’ And it took a while but he said that it makes him feel ‘impatient’. The TAs are on board with this, so that if [the pupils] talk about something in a different lesson, we’ll put [the word] on the wall. The teachers were also keen to make links from session to session, and for pupils and staff to continue to think about journal topics in between sessions to embed understanding. For some topics, the group created wall charts they could add to during the week, and there were some ‘take home’ thinking activities. Pupils’ engagement with journal sessions was monitored through video observations and teacher research diary report. Pupils’ engaged behaviours were identified and scored under the seven engagement indicators of the Engagement Profile – awareness, curiosity, investigation, discovery, anticipation, persistence and initiation and (Carpenter et al., 2011, 2015; Department for Education, 2017). Pupils in KS1 and KS2 showed predominantly ‘mostly sustained engagement’ (score 3) or ‘fully sustained engagement’ (score 4) behaviours when they were directly interacting with their journals or resources linked to them. The remaining engagement scores – 0 (No focus); 1 (emerging/fleeting engagement); and 2 (Partly sustained engagement) – were not in evidence in direct relation to the journals/related resources. Engagement outcomes were similar for one KS3 pupil. The other two KS3 pupils initially showed the full range of engagement behaviours (score 0-4) with a tendency towards low engagement. However, both pupils became increasingly engaged with journal activities, both within individual sessions and across the research period as demonstrated by the case example below. There was no engagement evidence for KS4 because the discussions were too personal to video. G’s increase in engagement during journal sessions took place over an extended period as shown by the table and associated pie chart below. 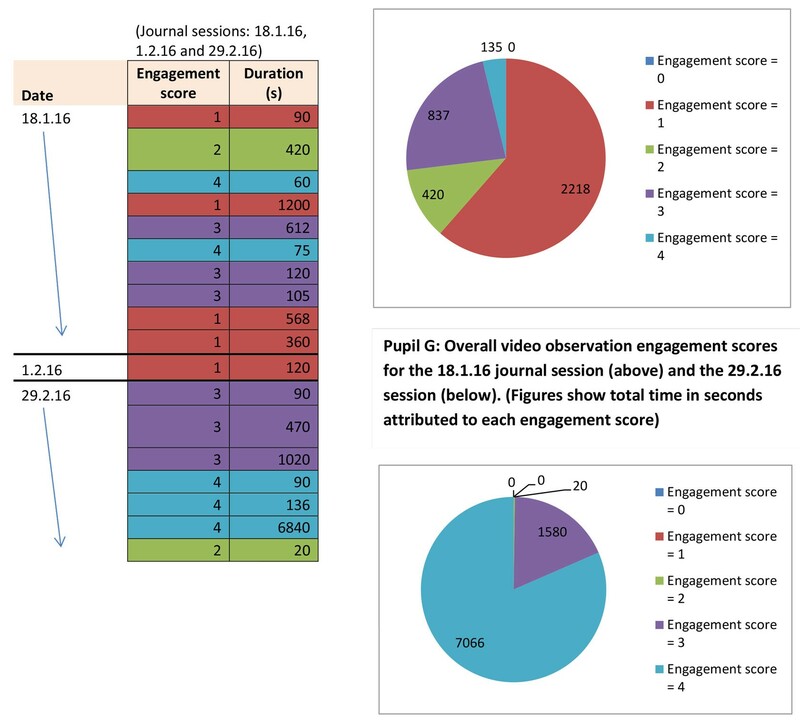 The video clips for both the 18.1.16 and 1.2.16 journal sessions had very low levels of engagement. However, by 29.2.16 his engagement was either mostly or fully sustained throughout the session. This was the pattern of his engagement in subsequent sessions. I’ve been teaching for years and never known quite how to help at such an important level… Because [these issues] are written down in the journals, I know that it’s OK to talk about these issues. Without the stimulus of the journals, when would we ever have had that conversation? When else would we have talked about it?’ The three teachers felt that the journals had created an ‘environment of trust’. Three of the four teachers involved in the project were whole hearted in their recommendation that Chadsgrove Teaching School committed itself to introducing weekly Mental Wealth journals across the school as part of the Positive Mental Health curriculum, and this approach has now been implemented. They felt that the benefits to the pupils involved and their own PSHE teaching had been significant. However they emphasised that the benefits had come largely from training received from the journals’ author, which promoted a therapeutic rather than a target based approach, and deeply influenced the way they had approached the journal sessions with the pupils. Acknowledgement: We would like to acknowledge with thanks the support of the parents, pupils, teachers and teaching assistants of Chadsgrove Teaching School and Professor Barry Carpenter; also South and West Association of Leaders in Special Schools (SWALSS), Marilyn Tucknott (Koa Ltd), author, and Butterfly Print Ltd, publishers of the Mental Wealth journals for funding, resources and support. Carpenter, B., Coughlan, B. and Fotheringham, J. (2010) Mental Health and Emotional Wellbeing (Complex needs series). London: SSAT. Carpenter, B., Egerton, J., Brook, T., Cockbill, B., Fotheringham, J. and Rawson, H. (2011) Complex Learning Difficulties and Disabilities Research Project: Developing pathways to personalised learning (Project report). London: SSAT. Carpenter, B., Egerton, J., Cockbill, B., Bloom, T., Fotheringham, J. and Rawson, H. (2015) Engaging Learners with Complex Learning Difficulties and Disabilities: A resource book for teachers and teaching assistants. Abingdon: Routledge. Department for Education (2017) The Rochford Review. London: DfE. Department for Education/Department of Health (2014) Special Educational Needs and Disability Code of Practice: 0-25 years. London: DfE/DH. Dossetor, D., Caruana, J., Saleh, H. and Goltzoff, H. (2009) Leading the Way in Mental Health and Intellectual Disability: A focus on the needs of Children and Adolescents in Schools for Specific Purposes in NSW. Sydney: The Children’s Hospital at Westmead. Emerson, E. and Hatton, C. (2007) The Mental Health of Children and Adolescents with Learning Disabilities in Britain. London: Foundation for People with Learning Disabilities/ Lancaster University. Maclean, G. (2013) Exploring Children’s Writing during a Therapeutic Storywriting Intervention: A mixed methods study (Ph.D. thesis). Southampton: University of Southampton. Murray, C.G. 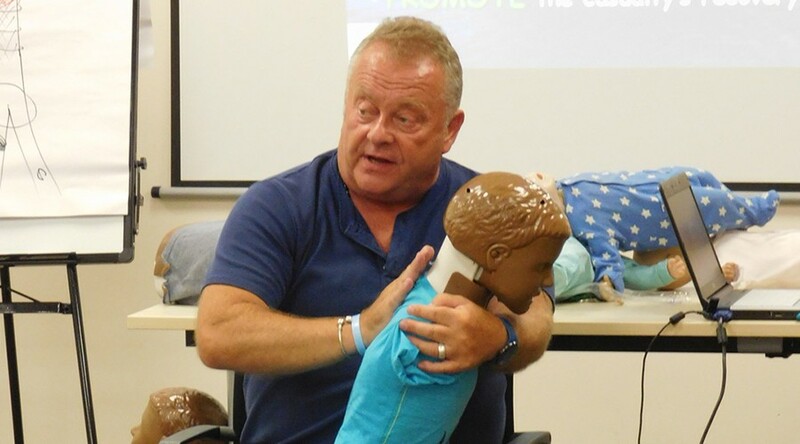 (2008) ‘Co-creating scripts with young children to help them feel better’, Teaching Young Children (National Association for the Education of Young Children), 2 (2), 10-13. Tucknott, M. (n.d.) KS1-KS4 mental wealth journals are available from Butterfly Print or Koa Ltd. Waters, T. (2010). Story Links Programme Evaluation: The impact of a parent partnership intervention that uses therapeutic storywriting to support pupils at risk of exclusion. Chichester: University of Chichester.